1 In one corner is the biggest computer company in the world. In another are big mountains. Along its beaches are some of the biggest rocks you'll ever see. It is green because it is wet. It is wet because it is next to the ocean. The ocean brings lots of ships to one of the biggest ports in the country. This is all the Pacific Northwest. 2 The Pacific Northwest is a term that means a lot to different people. Some believe that this area includes part of California. Others believe it includes parts of southern Canada. One thing everyone agrees on is that Washington and Oregon are part. Both states are the center of the Pacific Northwest. 3 Both states are about the same in size. 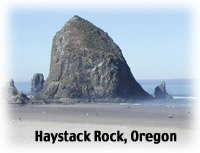 Oregon is Washington's neighbor to the south. Both have a coastline along the Pacific Ocean. Washington borders Canada to the north. Oregon borders California to the south. They share much more than a common border, though.